Here's the written pattern - photo tutorial below. Round 1: Make a magic ring. Chain 1. Now work 5 sc into ring. Gently close ring. Note the loop at the start of the next round - this is the loop from the 1 ch after you made the ring. Insert hook into that chain loop - 2 loops on hook. 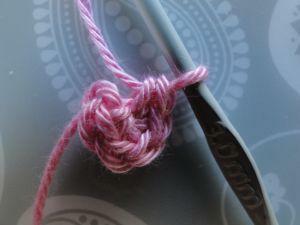 Pull yarn through both loops to join. Now you have six stitches to work into. Round 2: (Chain 4, 1 ss into next stitch) six times. Fasten off. 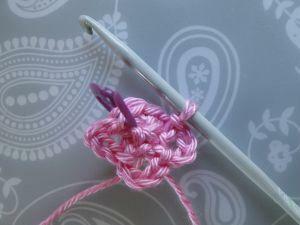 Weave this end from front to back through the back loop of the last stitch you crocheted into. Round 1: Make a magic ring. Chain 1. Now work 5 dc into ring. Gently close ring. 1. Make a magic ring and chain 1. Don't make that chain too tight - you'll be working into it at the end of this row! 2. Work 5 sc (UK dc) into the ring. You can see the little 1 ch loop on the very right of the stitches. Again, keep your tension nice and relaxed. 3. 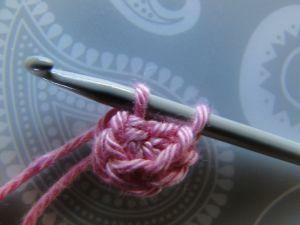 Carefully tighten your ring - you don't want to bunch up the stitches. You've made five stitches. In the next step, we'll join into that 1 ch loop to make our 6th stitch. 5. 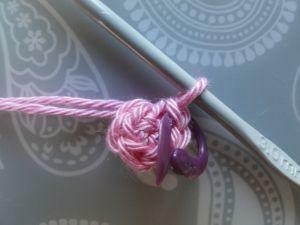 Pull yarn through both loops. You've now made a rather sneaky 6th stitch! And I'm putting a stitch marker in it so you can see it at the end of the next row. 6. 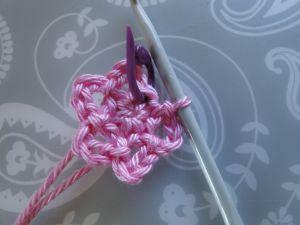 Now you can tighten your tension a little, working each stitch evenly to give the petals a good shape. Chain 4, ss into next stitch. Repeat all the way round. 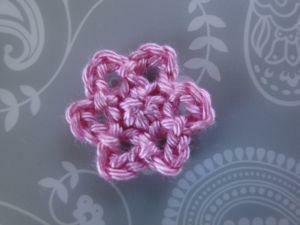 Here's my flower with three petals made. 7. 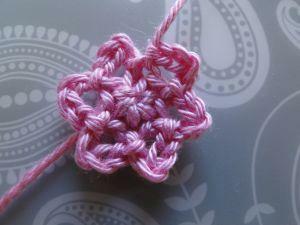 Five petals made - and ready to work the last petal into that joining stitch we made, which was our 6th stitch! Yes, there's a reason I'm emphasizing that stitch... so hang on! 8. Work your 6th petal. 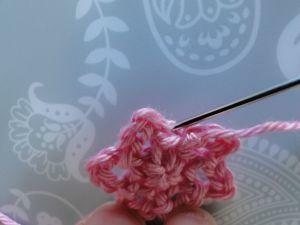 Keep that last slip stitch nice and small. Cut yarn. 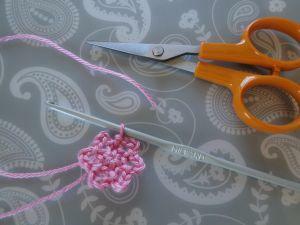 Hold your flower in one hand and pull the hook up, pulling the yarn through the loop and out. 9. Let's tidy this up a bit. Don't want our little knot spoiling things! First, tighten that knot as tidily as you can. 10. 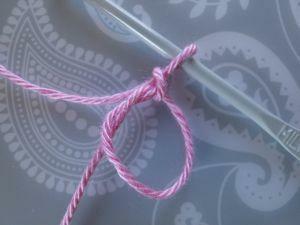 Thread the end of your yarn onto a blunt needle. Insert your needle through the middle of the 6th stitch you just worked into - ie between the two top loops of that stitch - and out to the back of your flower. That 6th stitch sure came in handy! 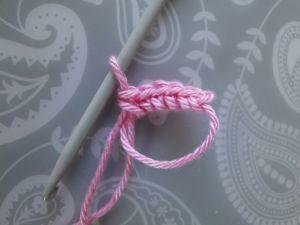 Then weave it in neatly. 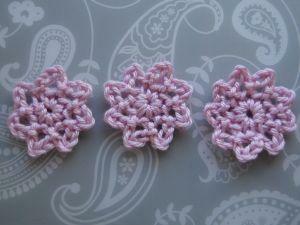 Below are three more flowers I've crocheted with this technique - seven, eight and nine petals. 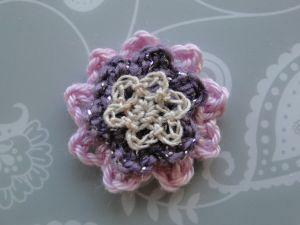 For seven petals, crochet 6 sc (UK dc) into the ring and join with a 7th stitch! And so on for eight and nine petals. 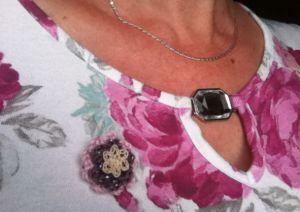 Make some multi-layer flower jewelry :) See how I made my Fleurette Brooch. 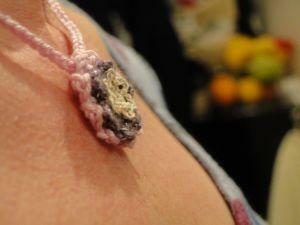 Alternatively, make the Fleurette Necklace!